In Rhode Island there is something that restaurants like to do and that is to put a Ritz Cracker crust on some seafood and bake it. Growing up in Rhode Island I didn't realize that this was not as pervasive outside of the smallest state. To me this is about as ordinary as spaghetti and meatballs or a hamburger. It wasn't until Jen visited me in Rhode Island and ordered it from a restaurant and remarked about the dish that I realized it was something of a local specialty. 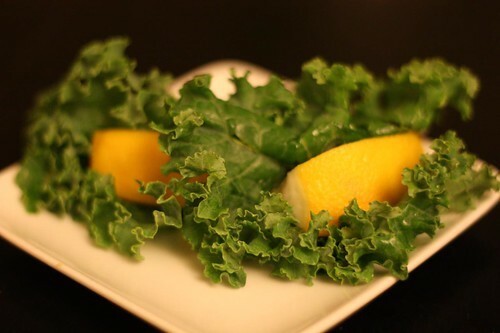 In Rhode Island when you order scrod -- which is a fish that does not actually exist -- they often serve it with a wedge of lemon in a little pocket of kale. We used to get cases and cases of kale into restaurants and it would all leave the kitchen exactly like this. The dish the cod was baked in would be placed onto an oval plate with a little lemon-kale garnish nestled along the side. I call this salad "Scrod Garnish Salad." 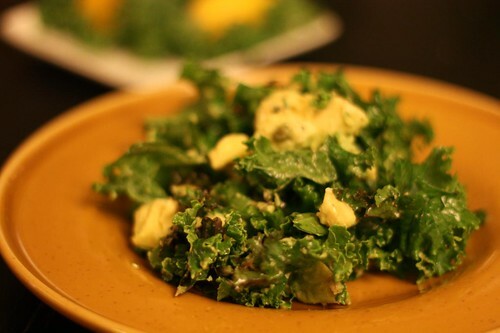 I started off with kale and lemon then added salt, pepper, Old Bay seasoning, olive oil, and diced avocado. For the actual dinner I decided to mix it up a little from its traditional form. I rendered some bacon in a pan with sliced shallot and fennel, lightly cooked some fresh English peas, then tossed it all together with some scallops and a little butter and olive oil. I put the whole mixture together in a baking dish with lemon juice, salt, pepper, and olive oil. 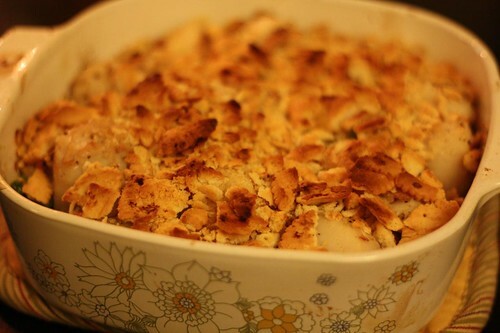 Then I crumbled up some Ritz crackers on top. I didn't actually use Ritz crackers. I used a knock-off brand that doesn't have high fructose corn syrup in it because. Somehow the boffins at this company have figured out the ancient secret of how to make a cracker without the use of high fructose corn syrup. What will they think of next? 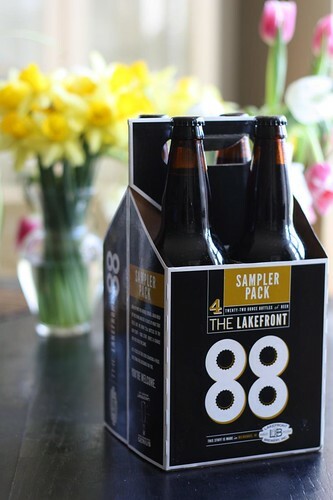 I got this sampler pack from Lakefront Brewery. Doesn't it look all majestic there on my table with some fresh daffodils? My life is so beautiful. 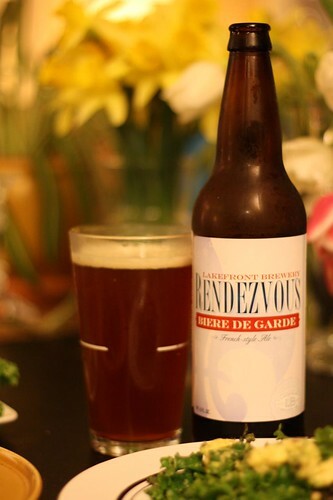 Since cracker-crusted seafood is something I learned how to make (and eat) in a French town in Rhode Island I figured I'd accompany it with a French beer from another key French area in America: Wisconsin. This beer was probably a little too heavy and malty to be paired with this dish but I don't really care about that. The French thing fit into the narrative nicely. The end result of this variation on a standard recipe was fantastic. While a nice sauvignon blanc would have went better with it that would have been boring. Unless it had a funny name. Then it would have been perfect. Wait, what kind of fish was it? Scrod?! 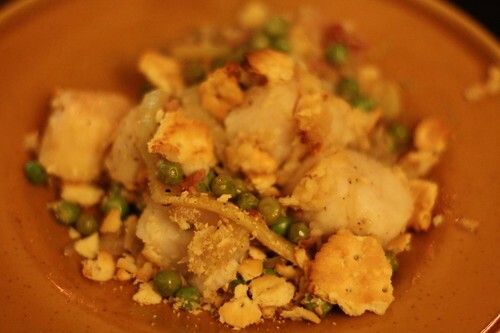 Also, is scrod just cod? Or is it just any whitish fish they can come up with at the moment and put in a warming pan? It was scallops I did last night. And scrod is usually cod. USUALLY. Sometimes it can be haddock or something. It's a very bizarre system.